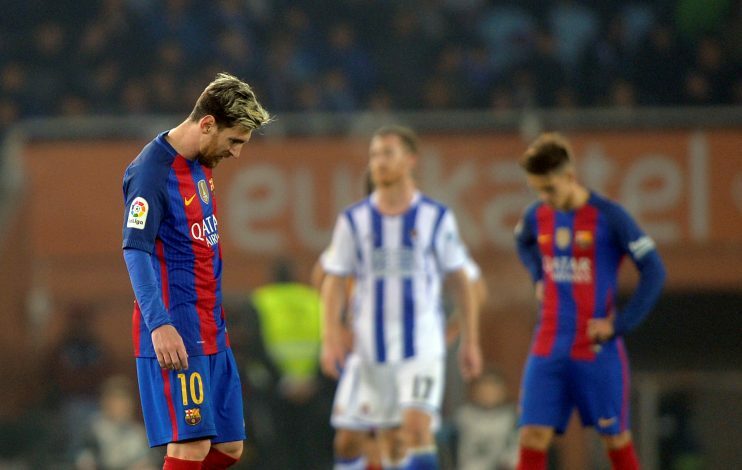 La Liga leaders Barcelona thrashed Deportivo La Coruña 4-0 over the weekend to maintain their supremacy and unbeaten start to the campaign. Luis Suarez and Paulinho scored a brace each, as Ernesto Valverde’s men ran clear winners. On the other hand, it wasn’t just meant to be for talisman Lionel Messi, who spurned several chances, including a penalty. The Argentine saw three shots hit the post as he cut a frustrated figure despite the side’s emphatic victory. It was Barca’s 13th win in the league, that sees them six points above 2nd-placed Atletico Madrid. Following the win, though, what Messi did with his boots post the full-time whistle at the Camp Nou was a treat. The club’s record goal-scorer opened both his boots and threw it to the fans, and the lucky spectators that received the same celebrated with joy. It was indeed a special moment for the fans getting their hands on a prized assets that belongs to the planet’s best footballer besides Cristiano Ronaldo. Despite not scoring against Deportivo, Messi is the leading scorer in La Liga this term, and could be on his way to defend his trophy as the league’s top scorer for the 2nd time running. Barca face arch-rivals Real Madrid at the Santiago Bernabeu, and with a 11-point cushion over their rivals, a win would affect the moral of Zinedine Zidane’s men, although the defending champions have played a match less.